Satellite Internet Services – the Future Broadband? Just when most users have managed to finally catch up with the latest, fastest Internet service a new solution pops up. This new service reaches the parts other broadband (and cable Internet) cannot reach. It is the new age of satellite Internet service providers that provide fast, reliable nationwide coverage. For most web developers and designers in the UK broadband means either ADSL or Cable. ADSL in particular revolutionised internet working in the UK by bring fast, affordable and reliable broadband internet to the masses. Cable internet took the provision further by offering faster headline speeds to those in service areas. If you live in a built up area, are covered by cable or are close to a BT exchange that is probably where you interest in Broadband options end. ADSL & Cable do the job well and provide enough bandwidth for all but the most demanding users. For those living in more secluded locations though the struggle for fast internet access can be an uphill one. Cable covers approximately 50% of the UK population and ADSL a more respectable 80%. Great news for those in provision areas, but frustrating for the 20% of the population left without a wired broadband connection. Even in areas that are officially covered speeds can be less than optimal as ADSL performance drops as you get further from the exchange: meaning that you could be paying for a fast connection yet connecting to the internet at a fraction of the speed of others on the same package as you. Obviously, if you can’t get wired broadband you need to go wireless, but what options are available? If you are struggling to get fast broadband internet access and only want to look at one option then Satellite Internet is for you. Two-way satellite connections from companies like Bentley Walker Satellite Internet cover the whole of the UK, as well as much of the rest of the world. If you can see the sky from where you work then chances are that Satellite broadband is an option for you. Performance is dependent on the solution that you opt for, but you can realistically get near ADSL speeds even in the most remote of locations. Costs are predictable higher than ASDL or Cable, but home/SOHO solutions like Tooway have closed that gap bringing you download speeds of around 4mb for around the same cost as a business ADSL connection. As 3G services continue to cover more of the country mobile internet could be a realistic option for you, particularly as you may already have all of the hardware required to get started. Most modern mobile phones can work as modems, making it a simple job of connection your computer to your phone by USB or bluetooth and using the mobile network for web access. Just like your telephone reception, performance will vary greatly from location to location as buildings and natural features can block the signal. Mobile internet can also be expensive, particularly if you are not on the right package, however the ease of set up still makes it a viable option particularly for those with only occasional requirements. Check with your mobile phone provider for more details. Wimax systems can be compared to home wireless, but on a much larger scale. 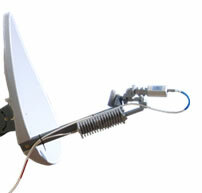 Such systems provide fast and affordable wireless broadband in an area centred around the providers transmitters. Sadly Wimax services are not all that common in the UK, but it is worth checking whether you are in a provision area. The site Samknows.com can check whether you have a wireless option near you as well as double checking ADSL and Cable availability at the same time. Very Nice posting! Today we are living in the world of speed and dial up connection are the outdated kind of internet. Satellite internet is one of those internet connection that provide internet speed and it can be say as the internet of the new globalization.